Most people have heard of a magic tool such as the Wand and wizard’s staff and maybe you are even familiar with the magic tool of the athame or plate or chalice. But did you know that you can find a magic tool right in your very own kitchen? Your refrigerator is a great magic tool because it is an electrical ground or conduit. That means it can ground out excess fire energies that are physical or psychic. Pain, stress, anger, inflammation, fever, headache and anxiety are all mostly fire energies. When you have these symptoms, you have an excess of some type of fire energy and you can use your refrigerator as a magic tool to ground out the excess energy. Other electrical grounds can also be used if you are somewhere where your refrigerator isn’t. An electrical outlet, light switch plate, or large appliances like a stove will also work. Just don’t use smaller electrical appliances or anything with electronic components like your computer as they can’t handle the excess energy and are likely to short out. If you are outside, use a telephone pole or electrical line. 1. If you can place the area of your body where the pain, stress or inflammation is directly on the fridge then do so. For example, if you have a headache in the front of your head, place your forehead against the refrigerator. If the headache is in the back of your head, then put the back of your head against the refrigerator. If you are dealing with overall aches or stress, lie down on the floor and put your feet on the refrigerator. 2. Concentrate and put your attention on the symptom you want to get rid of. Start flowing that energy into the refrigerator thus using it as a magic tool. 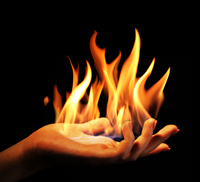 Fire energy flows quickly so you will only need to flow for a minute or two. Feel yourself pushing the symptom out of your body, letting it flow into the fridge. 3. Once you are finished flowing out the excess fire energy safely into the refrigerator, light a Sun Yellow candle. Put your hands over the flame (not so close that you get burned though) and feel yourself pulling in Sun Yellow energy which is a healing fire energy. This replaces the fire energy you put in the fridge so that you aren’t left with too little fire energy. Another minute or two of pulling this healing energy in should be long enough. This technique of using your fridge as a magic tool works really well for reducing almost any kind of pain or inflammation. If you find the pain getting worse after doing this procedure, you are possibly dealing with a buried unconscious issue which must be handled in a totally different way. This is rare, but if it happens, take some Rescue Remedy (available in most health food stores) and stop flowing energy. Now you know you have your own magical tool right in your own house to help you deal with a wide variety of excess fire energy symptoms. So next time you have a headache or feel stressed or angry, give it a try and see how the magic can work for you! I am a fire sign, Aries. Thank you . I will definitely try it. I love your books ,they are very helpful and magic works for me all the time. I don’t know much, but your books are helpful. Thanks for the feedback. Glad to know the magic is being passed on and used.